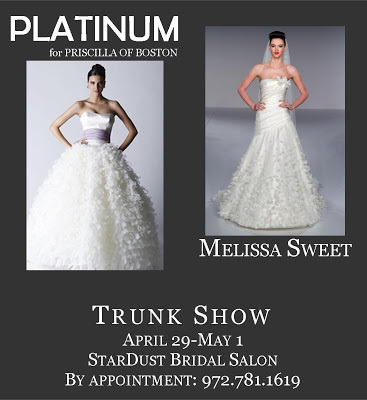 Join us for a fabulous trunk show featuring the full collections of bridal gowns from both Melissa Sweet and Platinum for Priscilla of Boston. Call to make your appointment or to be added to our walk-in waiting list: 972.781.1619. Hope to see you this weekend! 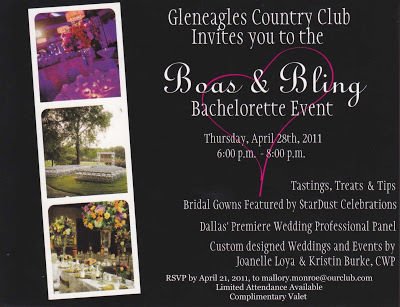 StarDust Bridal Salon is excited to have been invited to showcase some of our fabulous wedding gowns at the Boas & Bling Bachelorette Event this Thursday at Gleneagles Country Club in Plano. The open house event will feature tips, sweet treats and tastings from our friends Kristin Burke, CWP, and Joanelle Loya, the dynamic duo of customized weddings and events at Gleneagles. You will have the opportunity to enjoy a tour of the beautiful venue, which offers the perfect setting for your elegant wedding reception. The shin-dig will also feature a panel of premier wedding professionals who will dish wedding planning advice and answer your questions! We hope to see you there! 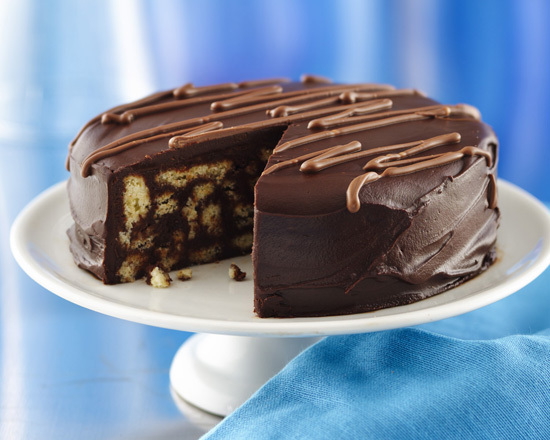 We are beyond thrilled to announce the launch of our beautiful new website! The site is a very comprehensive overview and showcase of all of our services and products from bridal gowns, bridesmaid dresses and accessories to stationery, tuxedos and full-service wedding planning and absolutely everything in between! We have included some fabulous tools to inspire you as you journey through the wedding planning process, and we sincerely hope you will enjoy using them to your full advantage! Come and check us out: http://www.stardustcelebrations.com/. Be sure to sign up for our mailing list if you’d like to be kept apprised of our sales and special events! Have fun! 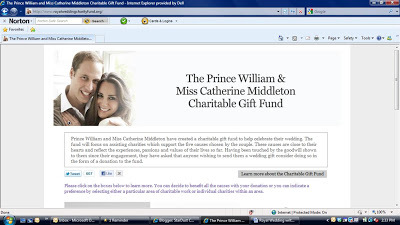 ﻿The wedding world is abuzz with the pending nuptials of Prince William and Miss Kate Middleton, now just a week away. “What will Kate’s gown look like?” “How much will they adhere to tradition versus bringing in their own modern touches?” “Who are the some 1,900 guests who have the privilege of receiving an invitation? !” are just a few of the questions everyone is dying to have answered. Speculation on the design of Kate’s wedding gown has been running rampant! 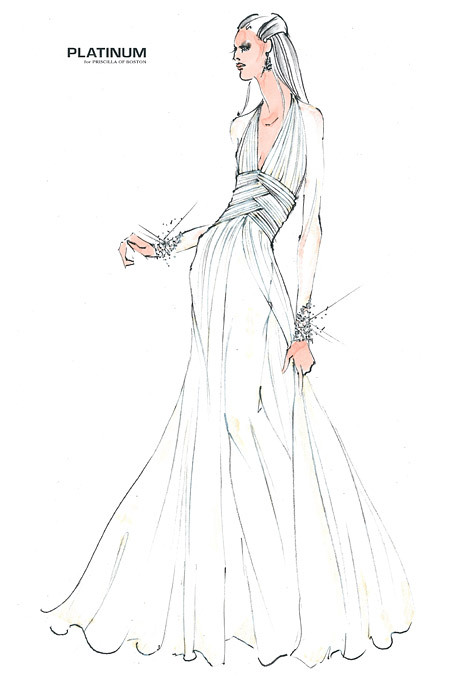 Of course her gown will have sleeves…or will it?! Will there be lace? Tulle? 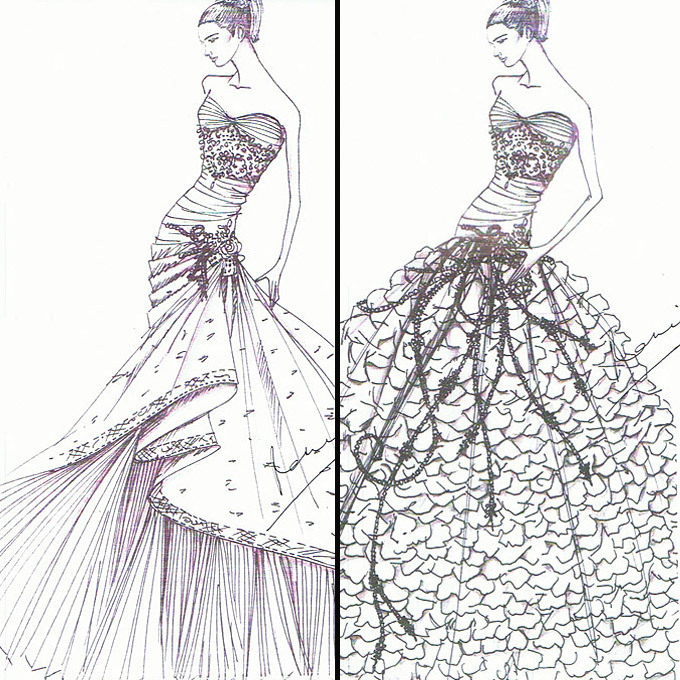 Full ball gown skirt or sleek and form fitting? Just how long will Kate’s train be?! 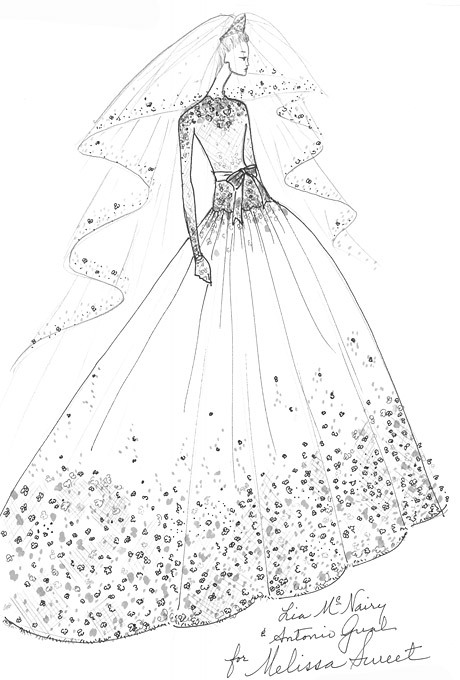 Well, we have heard some tidbits here and there…Kate’s gown is said to be designed by Sophie Cranstonunder the label Libelula. Sophie previously designed with Alexander McQueen. 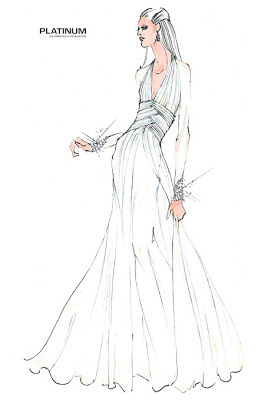 The gown is rumored to be made of ivory satin and lace with pearl buttons, a 10-foot train and sleeves, of course! 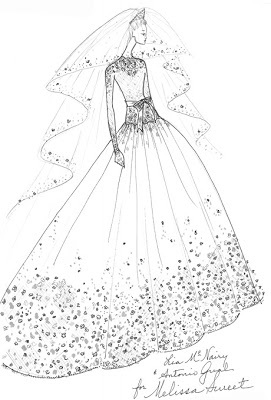 The bride also apparently has two back-up gowns in case the full design of her gown is leaked! 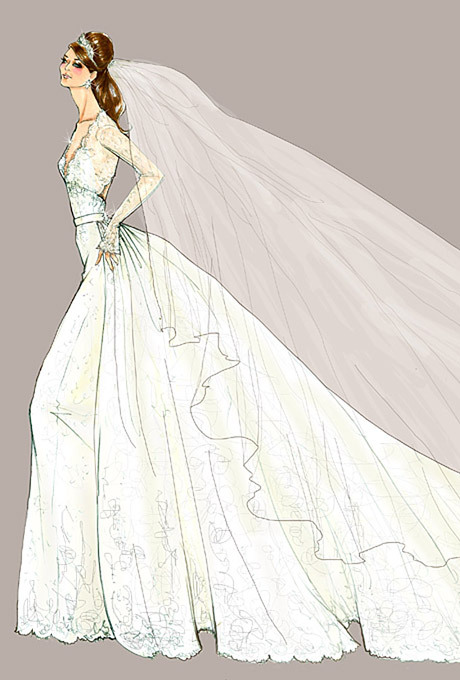 Some of our gown designers were asked by Brides.com to create their own Kate-inspired design, fit for a princess. Here are a few of them. Aren’t they fabulous?! There are numerous rules, traditions and regulations surrounding the wedding of a royal. The couple has chosen which they will stick to and which they will make their own. 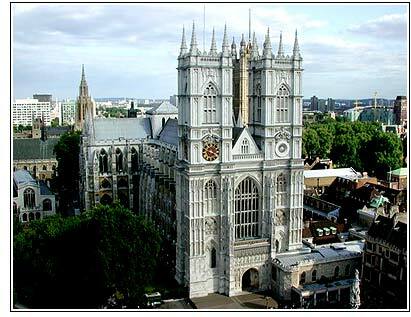 Will and Kate will marry at Westminster Abbey, the same location of the Queen’s wedding in 1947, and Kate will arrive in a car rather than the horse-drawn carriage that most royal brides use. As is custom, Kate’s bridal party will consist of several young children serving as bridesmaids and pageboys. What is not custom however, is Kate’s selection of her 27-year-old sister Pippa as maid of honor, the oldest main bridesmaid in recent royal wedding history. Other sweet traditions Kate will be honoring is carrying a sprig of myrtle in her bouquet, and she will leave her bouquet at the grave of the unknown warrior at Westminster Abbey as a tribute to the armed forces. And Kate will be wearing a wedding band containing precious Welsh gold from the Queen’s personal royal nugget. Will, however, has opted to not wear a wedding band, explaining that he is just not a jewelry kind of guy. Will’s “groom’s cake” will be a much larger variation of this. As a Mother of the Bride or Groom, it’s a challenge to find the just-right wedding day ensemble. You want to feel beautiful and comfortable, and maybe even a little glamorous, right?! But some of the dresses out there are just plain frumpy! We at StarDust are always looking to broaden your options and we’ve just brought in a new line that is perfect for the stylish mom! The Elana Collection is a line of customizable knit designs that offer a great variety of more modern styling for the discerning Mother of the Bride or Groom. Many of the styles can be ordered in more than two dozen colors and you can even add some bling if you like. These contemporary styled dresses and suits are comfortable, flattering and elegant. Call today for your appointment to check them out: 972.781.1619.